About a few months ago I talked about my current hair products that I am using. If you want to read the descriptions of each product here is the link: Current Hair Products. I am naturally a curly hair girl! I have not used any heat tools for a while now, except for a couple of times in the beginning of this year. I take better care of my hair as far as the kinds of products I use, and I actually have a hair care routine. That has not happened before, I usually used whatever shampoo and conditioner I saw. Well I actually was picky about the kind of brands I used. Like I would use Garnier Fructis, Tresemme , and the rarely L'Oreal. But I didn't really have a routine until a few months ago! First off I wash my hair once a week, sometimes twice. - Before I get in the shower I turn the water on. When washing your hair you do not want the water too hot. I've heard that If the water is hot that creates split ends and a lot of frizz. So makes sure it's warm. Anyways after I turn the water on I get in the shower. I wet my hair and I make sure my whole head is covered. I pour shampoo into my hands and I begin to rub them together. I use Raw Shea Butter Moisture Retention Shampoo. After that I scrub my roots. Scrubbing the roots is very important it ensures that all of the build up is gone. Then whatever shampoo is left I wash towards the ends of my hair. - Conditioning my hair is one of two most important steps I follow. I use Raw Shea Butter Moisture Restorative Conditioner. So I pump about three maybe four pumps of conditioner. I work the conditioner in my hair at the roots, but my main focus is my ends because it the oldest part of the hair. Every part of the hair needs tlc, but the ends need it a little bit more. After I finish putting the conditioner on I put a shower cap on. So I keep the cap on for about fifteen minutes. Then I take the cap off and rinse the conditioner out. At this point I start to detangle my hair with a wide tooth comb, that is specifically for detangling. - This is the second most crucial part. Deep conditioning for me is really important because it's fixing the dryness or damage my hair has gone or is going through. I use Raw Shea Butter Deep Treatment Masque. So I scoop some of this product out of the container and I work it through my hair. After that I put the same shower cap on my head as before. I then let it be for about 20 minutes. During this time I take my actual shower. When I am finished I remove the shower cap and while I am rinsing out the masque I detangle my hair once more. When I am finished I use my microfiber hair towel to dry my hair. If you do not have this towel you can use a cotton shirt. But do not use a regular towel, that will cause friction in you hair and make it frizzy. So anyway I use the microfiber towel it dries my hair about 70%, but I do not want it too all the way. I still need some of that liquid to complete my hair process, whether I am doing a wash and go or a specific hairstyle. *Sometimes I use olive oil in my hair. I know I need to get better with that, but I am taking baby steps. Oils are very important! - The last two steps are important because the products used gives my hair the moisture that it needs to survive the day. For this step I use Cantu Shea Butter: Leave in conditioning repair cream. I separate my hair into sections and I apply this product to each section thoroughly. I always start with back sections and then I work my way up. At this point I have stopped combing my hair, because I have already parted and detangled in the last two steps. - This part is just like the previous step. As far as applying the product on my hair in sections. Again I start on the back sections first and then work my way to the front. 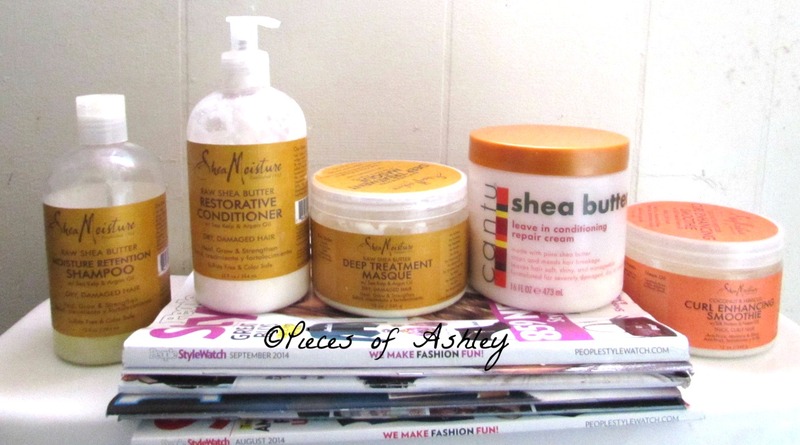 I use Shea Moisture: Coconut & Hibiscus Curl Enhancing Smoothie w/ Silk Protein & Neem Oil. This product is used to bring my curls to life. After applying these products to my hair, I let my hair air dry a lot. I have used the diffuser a couple of times. Thanks For Sharing Girl !!!! I love learning about others hair care as well! Because everyone is different, it's very interesting! It took me a while trying to find a routine that works for me. I am so surprised I have stuck with a routine for so long. Usually I would just wash my and not even think of a routine. My hair tends to get dry so I have to keep it moisturized. Thank you! I already follow you on GFC and Bloglovin! Sorry I do not have an instagram. Earlier, I commented on your latest post! My Blog is turning 2!